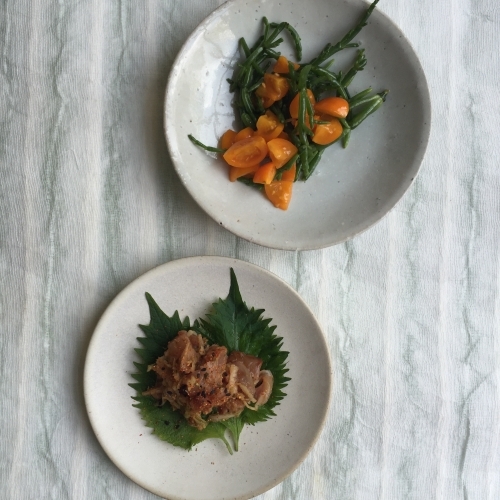 Raw mackerel with Japanese pepper and tomato and samphire salad. 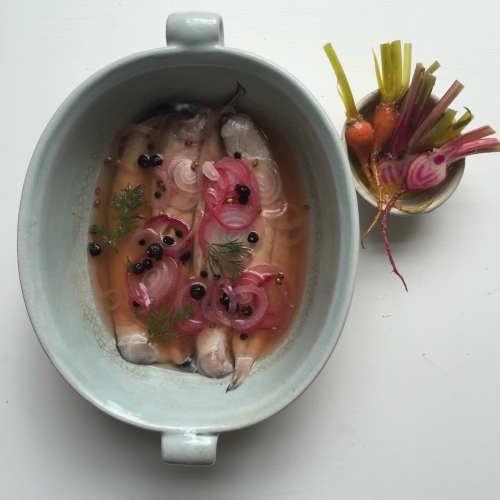 Mackerel, wine vinegar, dill, juniper, red onion and coriander seeds. 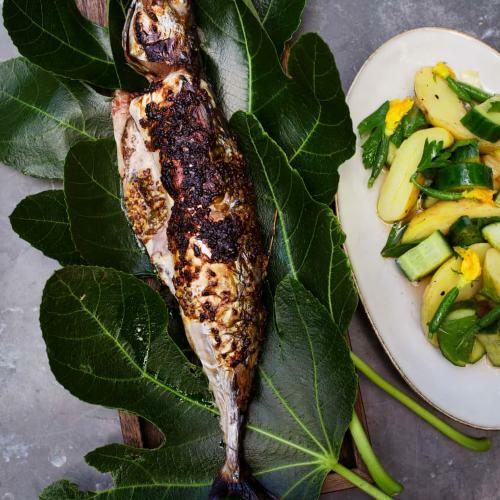 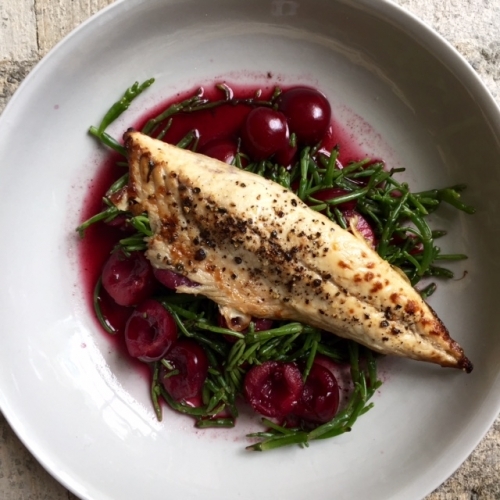 Grilled Mackerel, served hot with sweet-sour cherries and samphire. 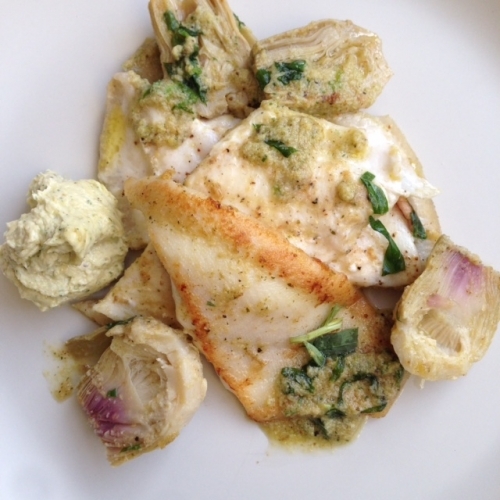 Fillets of lemon sole with tarragon, artichoke butter and artiichokes. 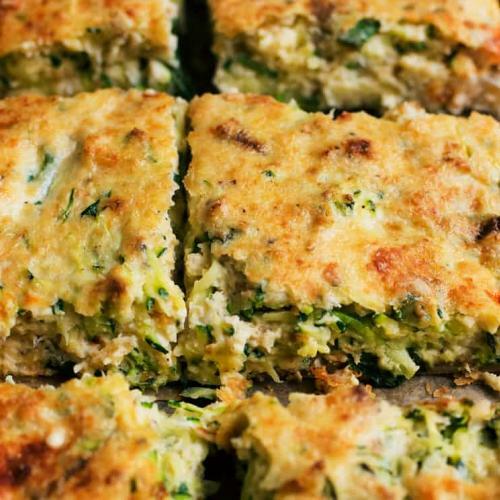 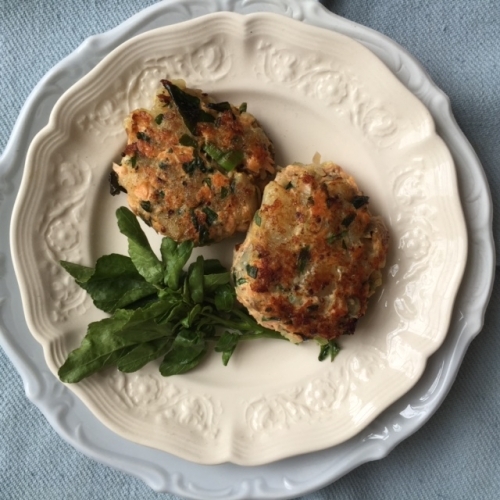 Fresh coarse-textured salmon cakes, made with crushed new potatoes and watercress. 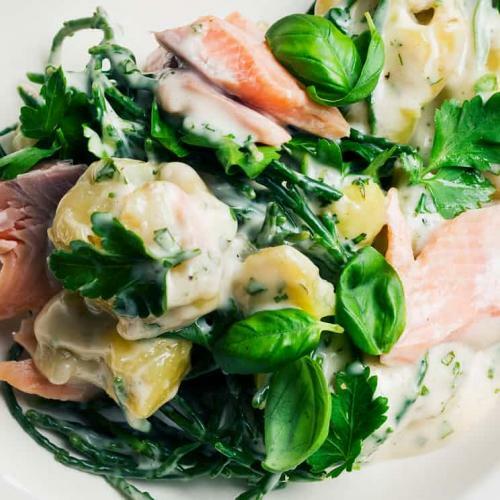 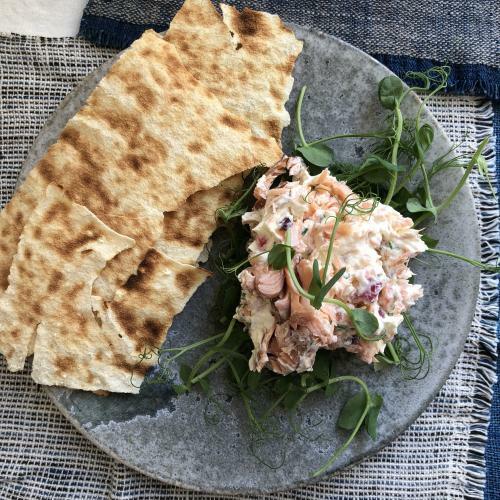 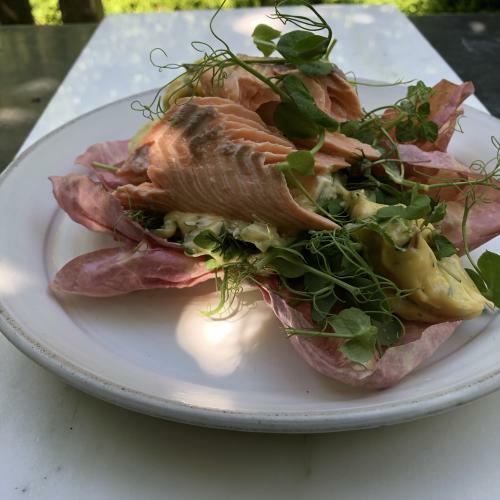 Salmon in home made mayonnaise seasoned with wasabi and crisp salmon skin. 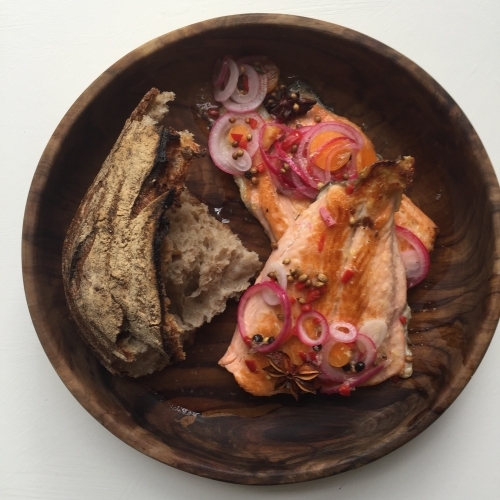 Salmon tail, marinated with vinegar, onions, coriander seeds, star anise. 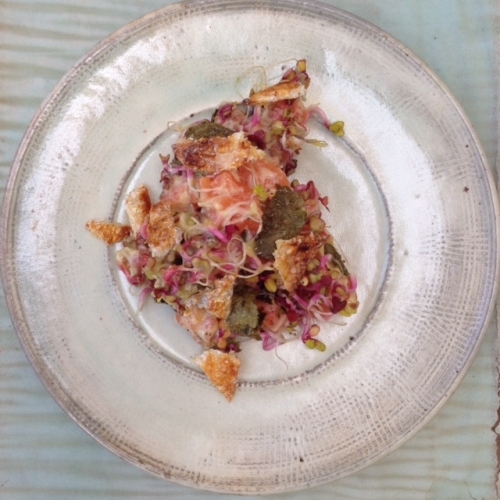 A soft summer pâté of two sorts of salmon, spiked with pickles and dill. 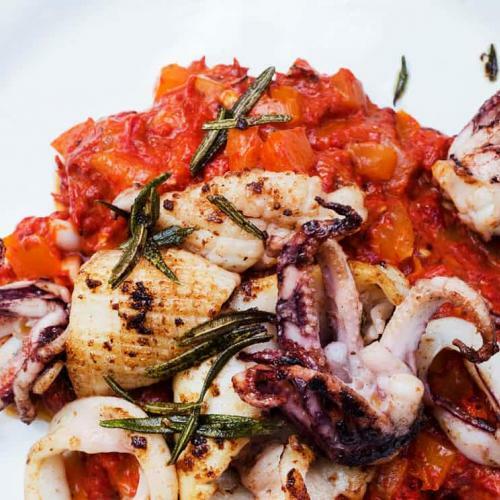 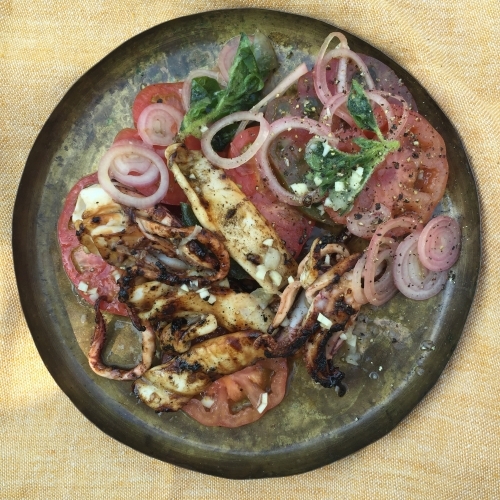 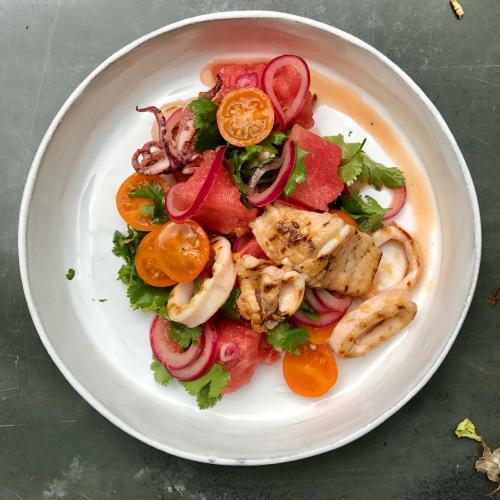 Grilled squid salad with tomatoes, olive oil and pink onions. 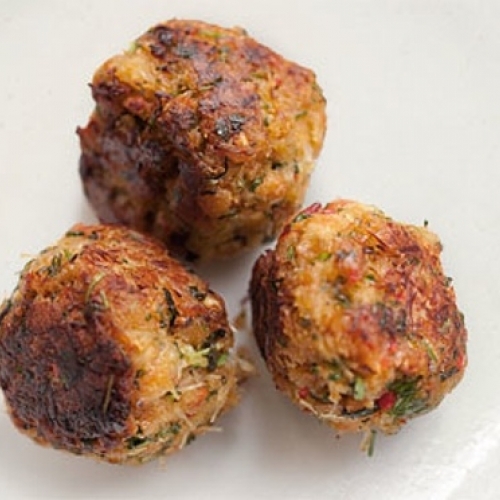 Spiced crab croquettes, with chilli, coriander leaves and breadcrumbs. 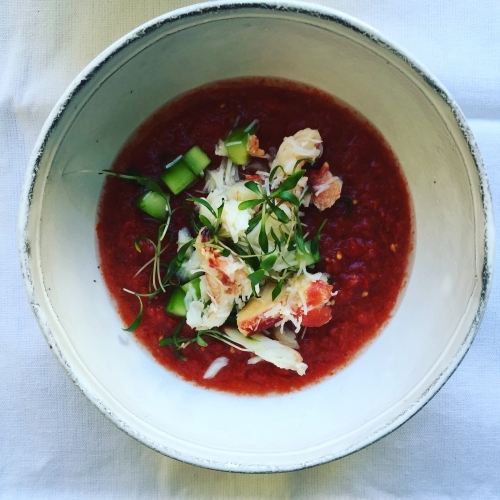 Chilled spiced tomato soup with fresh white crab meat. 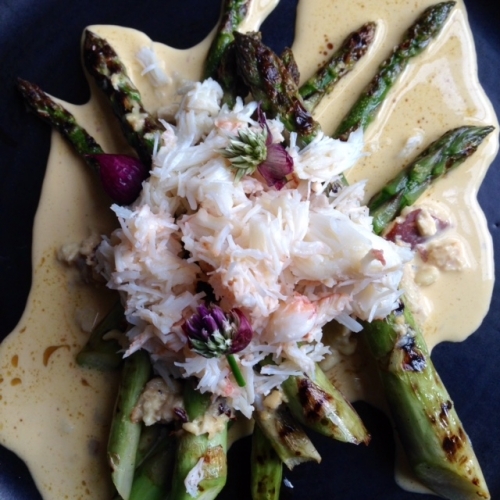 The seasons asparagus with crab and a sauce made from cream and the crab shells. 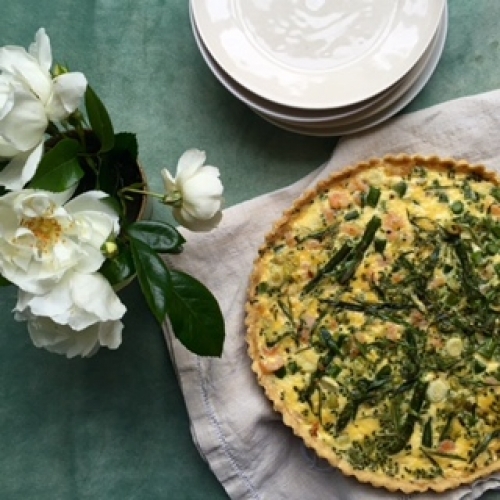 A tart of prawns, asparagus, creme fraiche and tarragon. 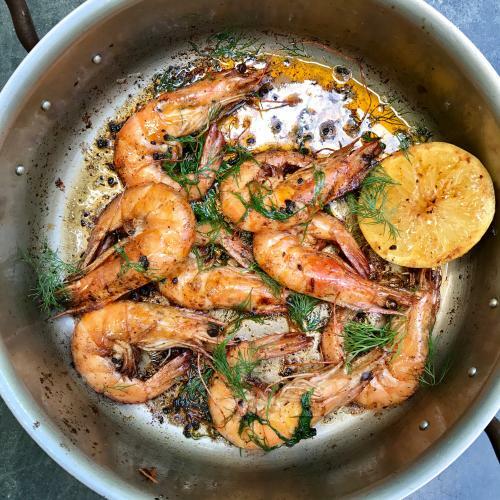 Langoustines with Parmesan and Chili. 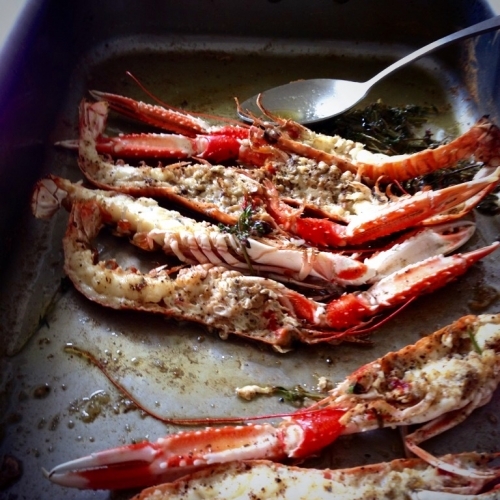 Langoustines grilled with Parmesan, paprika, chilli and butter. 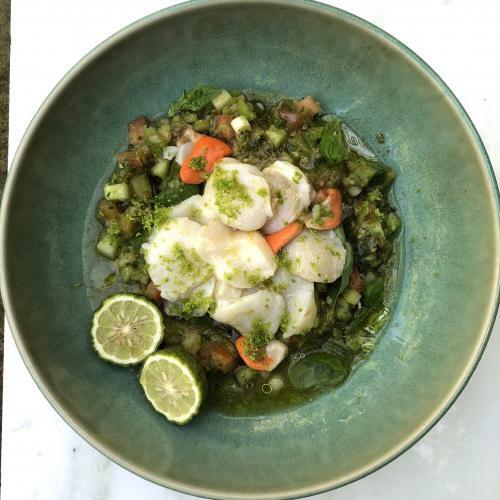 A ceviche that marries raw scallops with citrus juices and a little tomatoes. 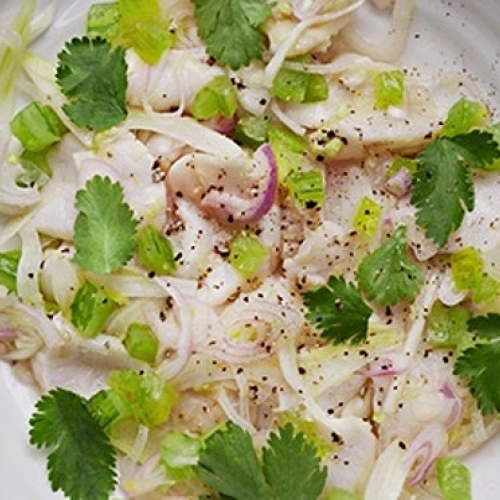 Clam salad with warm, buttery, tomatoey juices, substantial enough for a main diish. 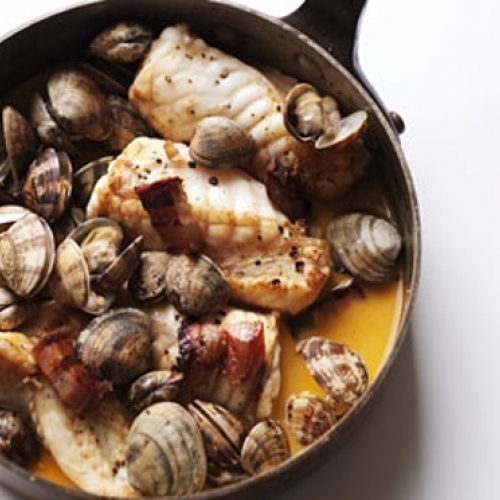 A quickly assembled dish of pancetta, clams and monkfish with paprika and vermouth. 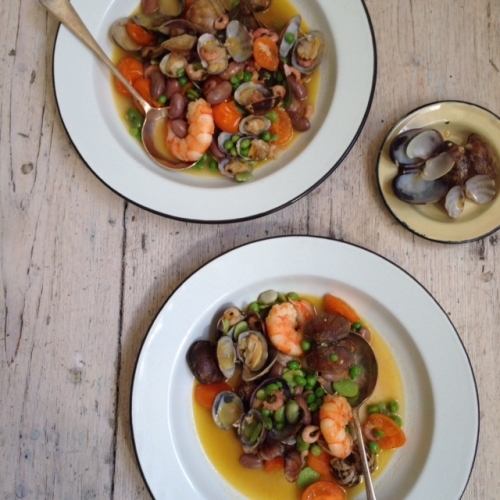 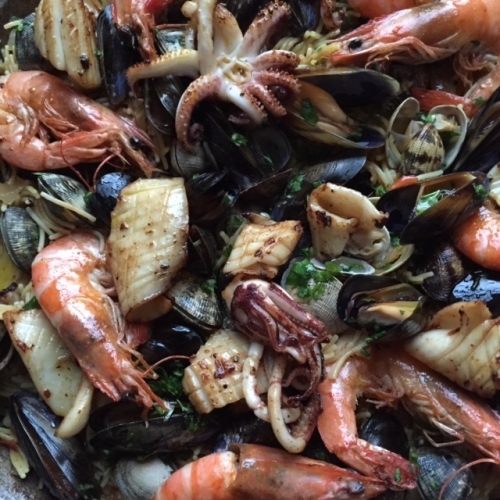 James's recipe for the famous Spanish seafood dish of shellfish and pasta. 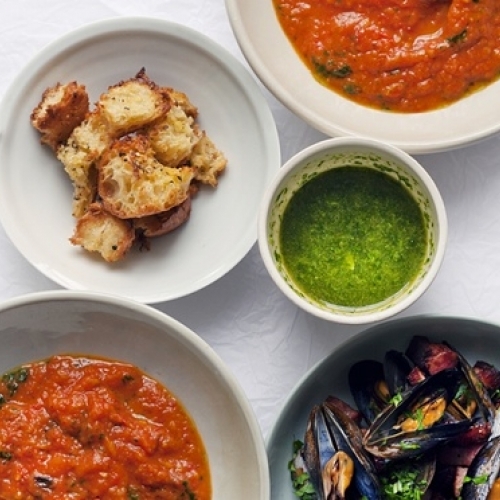 Tomato soup served with a stir-in of mussels, pancetta and tarragon oil.